It blew up a bit last weekend and I expected that there would be loads of fresh weed in the water. 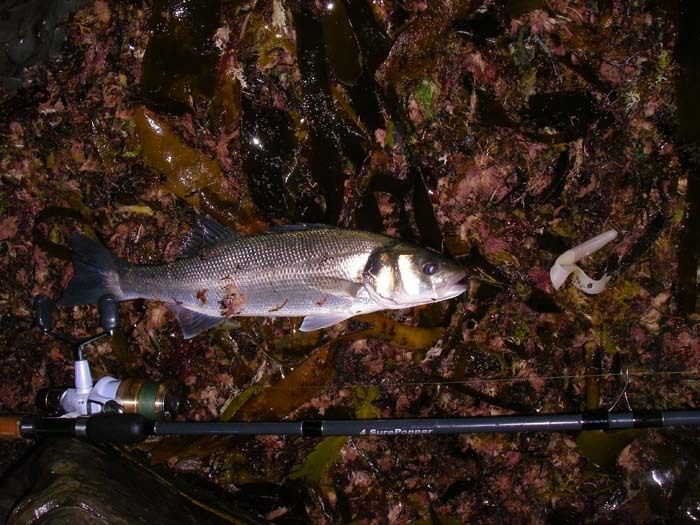 These are the conditions when Idotea come in to feed on the weed and when the bass come in to feed on the Idotea. Anyway, I got up early (too early - because of the heavy cloud cover it was still black) and made my way down to the coast. I wasn't the only one with the idea that there might be bass to catch because when I arrived I found my pals Rob and Mike already casting away. Sure enough it was weedy in the water's edge and the sea was a sort of grey murky colour. I had already tied on the soft plastic lure that I've been using lately and I was sure that it would fish through the weed soup without a problem. For twenty minutes we all spun assiduously with no hint of a bite then, suddenly, I was into a fish. 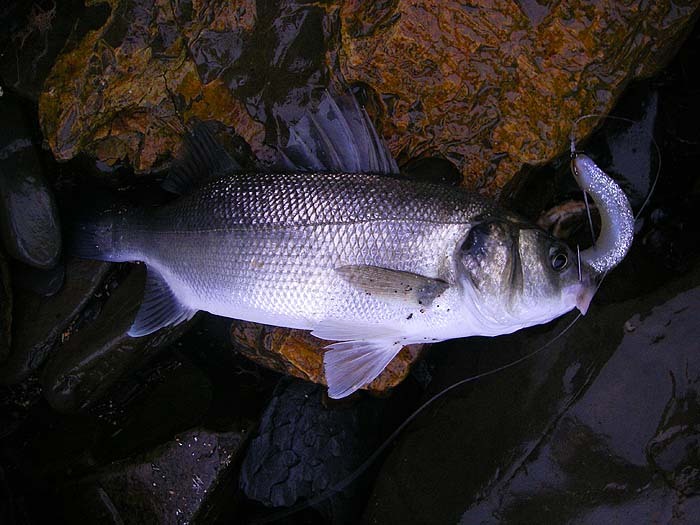 the bass was no great size (perhaps a couple of pounds) but I was pleased to get one. As it got lighter we noticed one or two nice fish tailing in the edge, obviously they were gorging on Idotea but they were so preoccupied that our lures were of no interest to them. After another fishless half-hour I left the other lads to it and set off back to the car. I'd noticed that my hybrid, soft plastic lure was beginning to come apart at the join so I swapped it for another one that I'd made. Of course, on my way back I couldn't resist a few chucks and it wasn't long before I had a second bite and hooked another bass even smaller than the first one. Typical of small bass my fish thrashed its way to the shore and I slid it onto the rocks to take a picture. It was only when I tried to remove the hook that I noticed that the back half of my lure had gone. The wild antics of the little bass had clearly detached the tail and I couldn't find it anywhere - downer! Clearly I hadn't done a very good job with the superglue. I packed in and went home intending to redo my other 'Slandra' before coming out again. My eldest son, who's a chemist, suggested that I try roughening the plastic surfaces a bit before glueing the bits together. The next morning I decided to have another go. My intention was to find a feeding bass and dangle a squid on its nose. Sure enough, when I got to the spot, the fish were grovelling away in the margin. My pal Richard was plugging but I stuck to my plan and lowered the squid in front of a feeding fish. Nothing!!! to be honest I wasn't surprised because, in years gone by, I've done the same thing on a number of occasions. Within minutes the squid is covered in Idotea but, the bass just don't seem to pick up on it. Bizarre! Richard moved on to try elsewhere and told me when he came back that he'd had one small bass. In fact after half-an-hour I'd seen the writing on the wall. the bass weren't going to gobble up my freelined squids so I thought I'd switch back to the repaired 'Slandra' for a final go. On about my tenth cast. Wallop! "Bass!" I thought and raised the rod as the tightly set clutch buzzed and gave line. 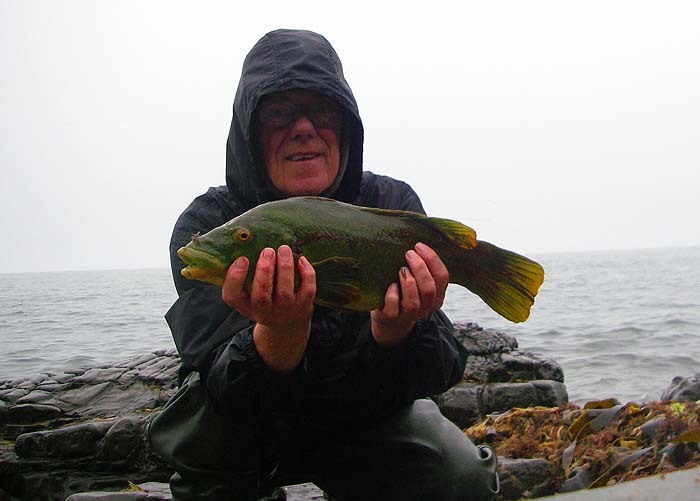 It was obvious that I'd hooked a decent fish but after a minute or so of give and take I saw a large, brown back break the surface - it was a big ballan wrasse. Now I've never had a wrasse on the new lure before so I was quite keen to land it and took my time before sliding it ashore. It proved to be a fine ballan of well over four pounds well hooked on the single hook. 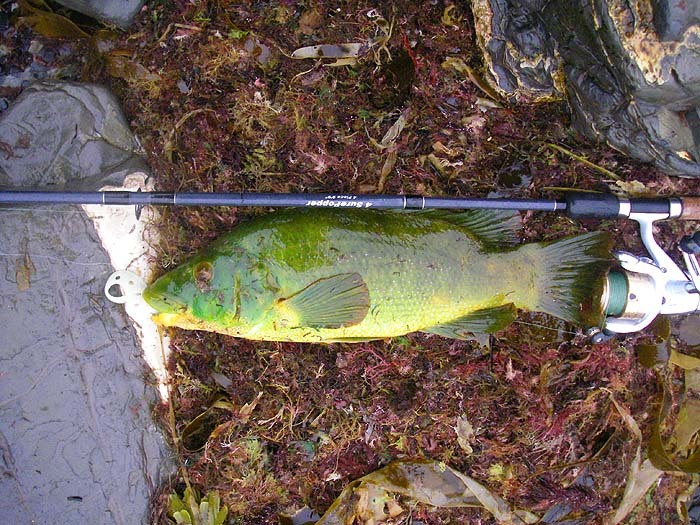 The only real surprise was that the wrasse had clearly grabbed the lure well in front of the mid-section. 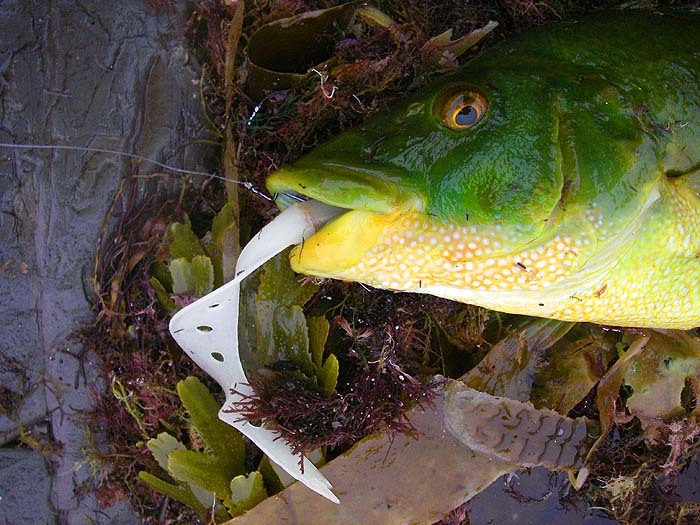 On plugs wrasse are generally hooked on the tail treble. You live and learn.